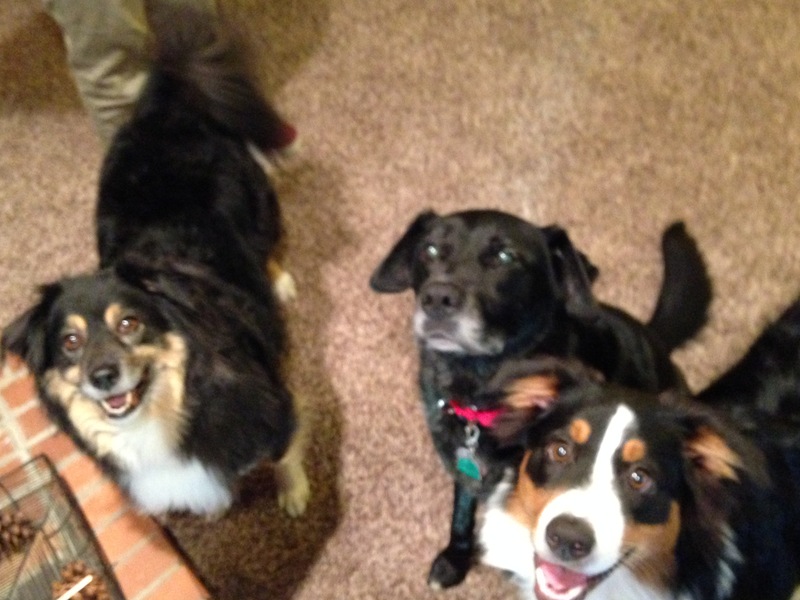 For this session I worked with (From left) Buddy a six-year-old Sheltie mix, Roxy a eight-year-old Black Lab mix and Jordy a eight-month-old Australian Cattle dog. I was called in to help with a number of individual issues but the priority was the aggressive behavior the guardians had witnessed from Buddy to Jordy. It only took a few moments to determine what was going on. Buddy used to be the only dog in the house and then along came Roxy and Jordy. Being a puppy, Jordy was pushing boundaries and his rambunctious behavior wasn’t appreciated by Buddy. Making things worse, the guardians failed to incorporate any real rules for any of the dogs. While Roxy can be a little reactive to excited situations, the real issue was the rivalry between Buddy and Jordy. Fortunately this was not aggression based. While Buddy did growl at Jordy a few times during the session, I interpreted it as normal disagreeing communication from Buddy when Jody was too rambunctious or didnt respect Buddy’s personal space. To help the puppy learn a little self control I went through an exercise I came up with a few years ago. The exercise helps the guardian practice establishing and enforcing boundaries while teaching the dog to restrain itself. After running through it twice, I walked Jordy’s guardians through it until they got the same results. To help Buddy develop a little self control I showed his guardian how to stop and wait each time that he started to get excited. Dogs often get into trouble when they are too excited. The best way to put an end to this behavior is to pause or stop the instant that a dog starts to show signs of excitement. We started out by making some changes to the way his guardian placed him on the leash. She had gotten into a habit of saying “Are you ready to go for a walk” in a high pitched and excited way. Narrating your intentions can often trigger a response in a dog and Buddy was no exception. His guardian was able to get up and start walking to where the leash was kept just fine. But as soon as she started to tell him what she was doing in that high pitched and excited voice, his energy shot up and he raced ahead of her to the leash stand. I called her back and we repeated the process without her saying anything. This had a good effect on Buddy as his energy level didn’t go us quite as much, although he did race ahead of her to the room with the leash. As soon as Buddy started running or got ahead of her, I had her stop and return to her chair in the living room. It took about six attempts, but eventually Buddy was able to sit and wait for his guardian to get up and walk over to where the leash was kept without racing in front of her. Because all the dogs pulled on the leash, I gave the guardians all Martingale collars and showed them how to apply the special twist to the leash. While the dogs were calmer than normal once we attached the leashes, they were still more excited than I wanted to see so I showed them how to use the same stop or pause technique when leaving for the walk. Once we were outside and the dogs were calm and minding their handlers, I had them walk each dog separately so that I could show them the proper placement, hand movements and corrections when the dog got out of position. After the individual walks, I wanted to get Buddy and Jody walking together. Whenever I am working with multiple dogs who don’t get along, I find that taking them out for a structured walk together is a great place to start. By keeping both dogs at a heel and on either side of the handler, the dogs are able to have a shared experience that they both participate in. This helps them practice being together while on an activity both enjoy. Because no dog is in front or behind, they see each other as equals which goes a long way towards building up the proper type of relationship. Knowing that these dogs had never walked together, I started them out with their own handlers, then after a short walk, one handler gave Jordy’s leash to Buddy’s guardian. After adjusting the leashes, she went off with a dog on either side. While Jordy needs some leash work, the dogs walk went off without any incident. Neither dog seemed stressed or uncomfortable and within a few steps, the group was looking like they walk together every day. When we returned from the walk, the dogs seemed to be more comfortable with one another. While this had started before the walk, it was certainly amplified after. Buddy’s guardian kept commenting on seeing her dog staying in the room with Jordy, something that rarely happened before this session. But now, the dogs were not only in the same room, they walked past and sat next to one another without any issues at all. When Jordy sniffed Buddy’s rear end, his guardian told me it was something she had never seen before! By the end of the session the dogs and their guardians were much more relaxed. The dogs were responding to their guardians lead and direction, the dogs were communicating with one another and there were no signs of stress, aggression or anxiety. Now that the humans have taken over the leadership position in the dog’s eyes, they were laying back and letting down their guards knowing the humans had the situation under control.